Quebec, also Québec, Quebec City or Québec City, is the capital of the Canadian province of Quebec. As of 2011, the city has a population of 516,622, and the metropolitan area has a population of 765,706, making it the second most populous city in Quebec after Montreal, which is about 233 km (145 mi) to the southwest. The narrowing of the Saint Lawrence River proximate to the city's promontory, Cap-Diamant (Cape Diamond), and Lévis, on the opposite bank, provided the name given to the city, Kébec, an Algonquin word meaning "where the river narrows". 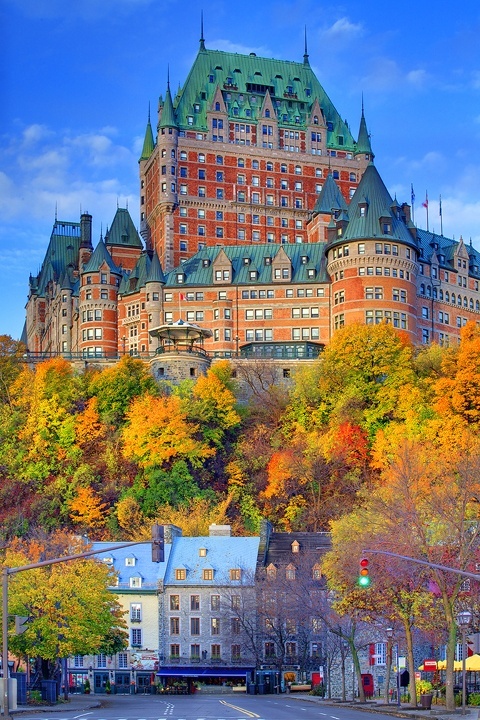 Founded in 1608 by Samuel de Champlain, Quebec City is one of the oldest cities in North America. The ramparts surrounding Old Quebec (Vieux-Québec) are the only remaining fortified city walls that still exist in the Americas north of Mexico, and were declared a World Heritage Site by UNESCO in 1985 as the 'Historic District of Old Québec'.